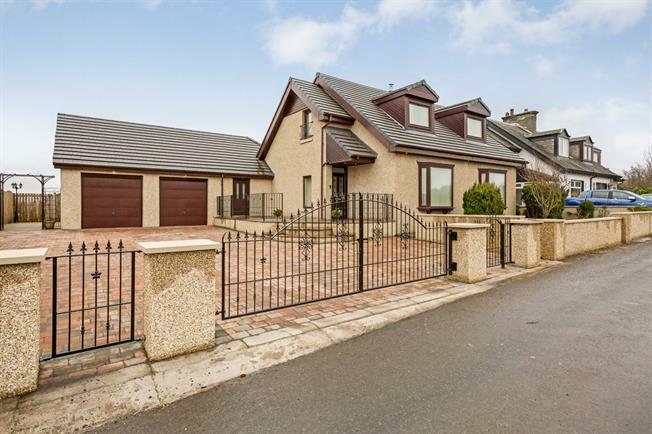 4 Bedroom Detached House For Sale in Falkirk for Offers Over £440,000. Impressive five bedroom villa in a picturesque rural location with fabulous countryside views. Meticulously upgraded to an exceptionally high specification to provide a wonderful family home. The accommodation extends over two levels and comprises of entrance hallway, stunning lounge with French doors to the rear garden, sitting room with multi fuel burner, a open plan kitchen to the dining area, contemporary bathroom , five double bedrooms (4 with en-suites), utility room and integrated double garage. As mentioned fixtures and fittings are to an exceptional standard with particular note to the re-fitted bathrooms and kitchen. The home further benefits from oil central heating and double glazing. parking. Private rear gardens with decked and patio areas. A small fenced paddock, approximately one fifth of an acre is found to the side of the property, ideal for a pony.